This is written and directed by Mike White (who also has a small role), his first major director debut. White has fun with the character of Brad, as well as steering him to his truth. 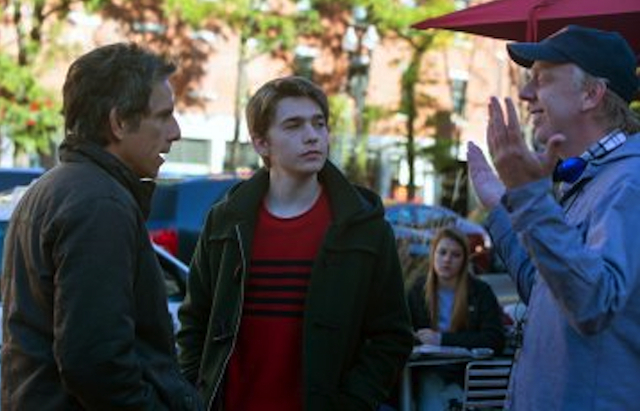 Although Stiller’s Brad seems to have it all… comfortable lifestyle, devoted wife and loyal son, he is bedeviled by the “what ifs” and comparisons to his old college friends that start to strangle his life. It all comes together with the college visit, as Brad goes through a series of situations that test his confidence and viability. What makes this all work – and takes it away from the problems of the “first world” – is the actual persona of Brad, who individually wrestles with these problems for no apparent reason, which becomes clearer as he goes through the looking glass of his own life. There are some nice symphonic realizations that occur, and a redemption for the main character. Brad Sloan (Stiller) is at a crossroads in his life, everything he thinks about and touches seems unfamiliar to him. 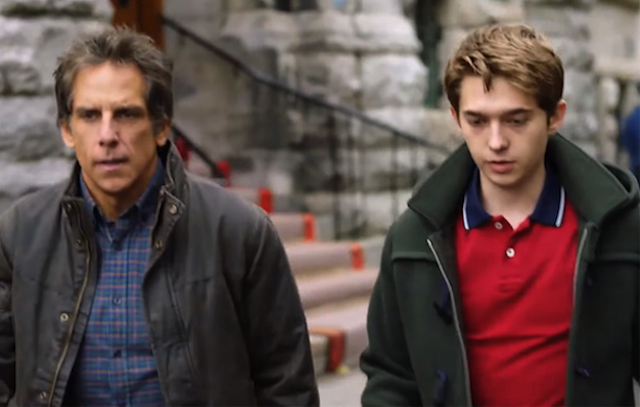 This is exacerbated when he takes his musician son Troy (Austin Abrams) to the East Coast for some college visits, including Harvard and his own alma mater, Tufts. Brad switches all gears toward his son, which causes a bit of strain during the trip. When a Harvard meeting is missed, Brad gets it rescheduled by calling upon Craig (Michael Sheen), and old college buddy who now is a TV personality. This gets Brad to think about his other college buddies Billy (Jemaine Clement), Nick (Mike White) and Jason (Luke Wilson), who have all found success, and in making comparisons this is part of Brad’s downward spiral. Ben Stiller is perfect for the angst surrounding Brad, having made a career of playing this type in various roles. This is a bit more subtle and character oriented than his outright comedies, and he is able to transition the character through virtually all emotions. White’s script also teases the character, as he connects with a younger coed (Luisa Lee) for a late night talk session, and Stiller works in Brad’s disappointment at failing that connection. White then effectively brings that failure back later, for a better perspective. Austin Abrams (“The Walking Dead”) also breaks out here, as he makes his own transition from kid to young adult roles. His Troy is complex, more so than his freaking-out Dad, yet he also plays it as a believable college bound kid. That balance is tricky, and his understanding of the relationship between the father and son was mature, and completely connected to the story and his character. Despite some thinly drawn roles (Jenna Fischer as Brad’s wife is barely present), there are some connective philosophies in Mike White’s script that are true reminders about living in the moment, and understanding what we can in this short life trip. The emotions in these scenes hit hard, both for Brad and the audience, especially if your “status” is thinking about such virtues. One of the great joys in the movie experience is the story ability to move us, and make us think of better times and possibilities. “Brad’s Status” is that kind of film. And the film also keys in again on Harvard University, again as the be-all and end-all of the American college life. I prefer the portrayal of Harvard in “The Paper Chase,” which rightly puts the overall college experience as nothing more than a weigh station of privilege, at a questionable investment now of close to a quarter million bucks. At least they should have a better football team.